CapitaLand and Singtel buildings in Singapore’s central business district. CapitaLand said on Monday that it entered a 50:50 joint venture to acquire around 70 percent of the Pufa Tower office property in Shanghai, China, for 2.752 billion yuan, or around S$546.3 million. City Developments said on Friday that Golden Crest Holdings, which is a joint venture 80 percent owned by its wholly owned subsidiary Bestro Holdings, entered a deal to sell its entire interest in Victorian Investment Holding, or VIH, for S$75.3 million. 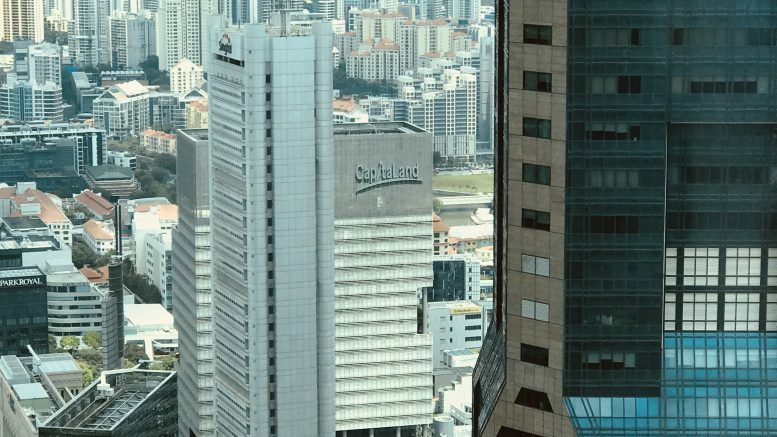 SPH REIT reported on Friday net property income for its fiscal first quarter slipped 1.0 percent on-year to S$41.8 million, mainly on lower revenue from the Paragon mall, partly offset by higher contributions from the Clementi Mall and the Rail Mall. DeClout said on Sunday that the company’s Chairman and CEO Wong Kok Khun had notified the board of directors of a possible transaction involving the company’s shares in connection with a potential general offer by an independent third party. BreadTalk said on Friday its wholly owned indirect subsidiary Megabite Hong Kong entered a deal to acquire the 25 percent it didn’t already own of Food Republic Guangzhou F&B Management from Wingain Global. Singapore Telecommunications said on Friday that its wholly owned subsidiary Singtel Enterprise Security (US), or SES US, increased its share capital by US$17 million to US$463.77 million by issuing 17 million shares at US$1 each to its holding company, Singtel Enterprise Security (Australia), it said in a filing to SGX after the market close. In addition, Singtel said its wholly owned subsidiary Optus Cyber Security increased its share capital by A$8.12 million to A$8.12 million from A$2, by issuing 8.12 million new shares at A$1 each to its holding company Singtel Cyber Security (Asia Pacific). DeClout said on Friday it had sold a total of 48 million Procurri shares at S$0.32 each to two independent third parties via separate married deals. After the sale, DeClout will continue to hold 84.32 million Procurri shares, or around 29.62 percent of Procurri’s issued shares, excluding treasury shares, it said in a filing to SGX after the market close on Friday. The net proceeds of around S$15.2 million from the sale are earmarked to repay external borrowings, DeClout said. A separate filing to SGX on Sunday said that Soh Chooi Lai had become a substantial shareholder of Procurri via the off-market acquisition of 37 million Procurri shares for a consideration of S$11.84 million. That raised Soh’s direct interest in Procurri to 13.51 percent from 0.51 percent previously, the filing said. In another statement filed to SGX on Monday, Procurri Corp. said that the possible transaction in its shares by an interested third party, which it first announced in September, was separate from DeClout’s share sale. Due diligence on that potential transaction was still ongoing, and the third party was also considering other transactions involving the company instead, it said. Silverlake Axis said on Friday it had secured eight contracts in the first six months of fiscal 2019 to deliver digital-economy services to existing customers in Malaysia, Singapore and Thailand. The Malaysian contracts include the delivery of payment services at three major financial services groups and the deployment of “channel innovations” at two other financial services providers to improve customers’ digital experience, Silverlake Axis said in a filing to SGX on Friday. In Singapore and Thailand, the contracts include services to support digital banking and payments at three financial institutions, it said. The contracts are expected to contribute positively to the company’s results for the current financial year, but further details won’t be disclosed due to confidentiality clauses, it said. Silverlake Axis said on Friday its wholly owned retail automation subsidiary QR Retail Automation (Asia) signed a software and services contract with AEON Vietnam. “With its rapid expansion in Vietnam, AEON Vietnam has setup its local IT operations and contracted QR to provide user licenses and data migration services to support its current and future business growth,” Silverlake Axis said in a filing to SGX on Friday. It noted that AEON Vietnam, which is wholly owned by AEON Group Japan, began operations in 2011 using QR’s PROFIT Automation Solution, operated out of AEON’s IT hub in Kuala Lumpur. Silverlake Axis said the contract was expected to contribute positively to its results in the current financial year. Perennial Real Estate Holdings said on Friday that, via its wholly owned subsidiary Perennial BSL, it took a 40 percent stake in PREH Properties, a joint venture in Sri Lanka. The remainder of ownership is held by other parties, including a local partner. Perennial’s stake in PREH Properties, which will invest in Sri Lanka real estate, represents an investment of 200 million Sri Lankan rupees, or around S$1.49 million, it said in a filing to SGX after the market close on Friday. BreadTalk said on Saturday that it opened its first Song Fa restaurant, which specializes in bak kut teh, or spicy pork-rib soup, in Northern China, at Beijing APM Mall. Henry Chu, CEO of BreadTalk, said in the statement that since launching the brand’s first outlet in Shanghai last year, it had been met positively by consumers on the mainland. BreadTalk and Song Fa set a joint venture agreement in July of 2017, the filing to SGX on Saturday said. Yeo Hart Pong, Song Fa’s managing director, added that it was his company’s mission to spread bak kut teh as one of Singapore’s iconic dishes, with China the most-valued market outside of Southeast Asia. It also has outlets in Indonesia as well as its base in Singapore, Yeo noted. PACC Offshore Services Holdings, or POSH, said on Friday that it tapped Kurush Phiroze Contractor, age 58, as the director of its subsea business. Contractor, who will be responsible for developing and growing the POSH subsea division, was CEO of subsea service provider Kreuz Group form 2008 to 2017, POSH said in a filing to SGX on Friday.